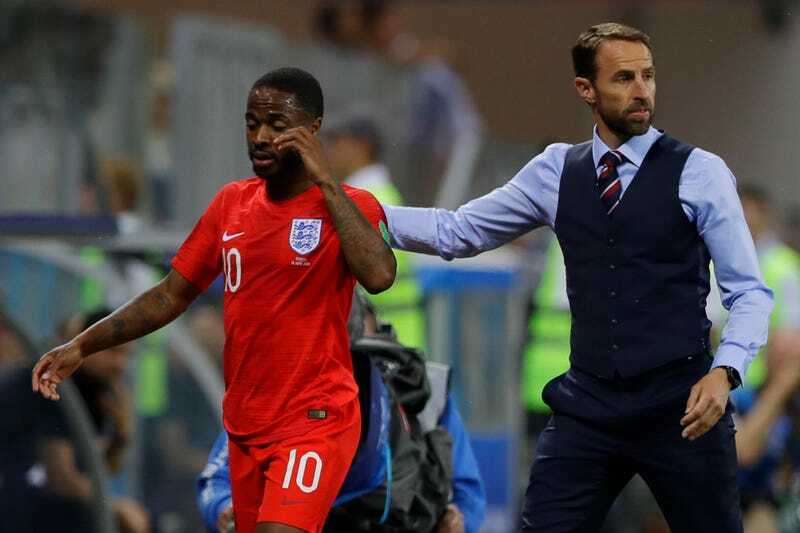 Gareth Southgate walks off Raheem Sterling after subbing him out against Tunisia. The notes indicate that Ruben Loftus-Cheek will start in midfield in place of Dele Alli, who suffered a thigh strain against Tunisia. The FA confirmed last night that an MRI revealed a muscular issue, which would seem to give weight to the photographed teamsheet. Which is a big deal because said teamsheet also shows Marcus Rashford starting at striker in place of Raheem Sterling. England manager Gareth Southgate tried to ignore the reports, but when directly asked about it, tried to blame the media. Three things. First, this is not actually that big a deal, and does not aid Panama all that much. The moves were relatively obvious: Sterling, despite a good early chance, all but disappeared as the Tunisia match went along. Rashford and Loftus-Cheek were both quite good as substitutes. Alli is hurt. If you had asked most observers to predict England’s XI against Panama, this would’ve been it. It’s also not as if Panama’s preparations change significantly, no matter who England’s second striker is. Oh, and if England can’t beat Panama even having tipped its lineup, England have way bigger issues than opsec. Third, I don’t think Southgate actually believes what he said. He’s been around long enough to know the deal, especially with the English press. But it’s way better for everyone involved for him to blame the media rather than blame his assistant. In the end, everyone here is playing their roles to perfection.